Want to learn more about Topics? Staying updated on all the new tools and resources Facebook has to offer seems nearly impossible at times because of the social network’s constant growth. Today, let’s take a look at 5 tools and resources on Facebook that can help a variety of users with different backgrounds and motivations. 1. Facebook Toolbar: The Facebook toolbar allows users to constantly share with their friends in their network while they browse the web. The toolbar for Internet Explorer and Firefox gives users the ability to get notified about pokes, friend requests, messages, invitations and general notifications. The share feature of this toolbar lets you share the page you are currently browsing by sending it to your friends or posting it to your Facebook Wall. This feature also allows you to upload photos to Facebook directly from your computer, while you continue to browse the web. These features allow you to easily share your favorite blogs, articles and photos with all your friends much more quickly than if you were going back and forth between Facebook and surfing the web. 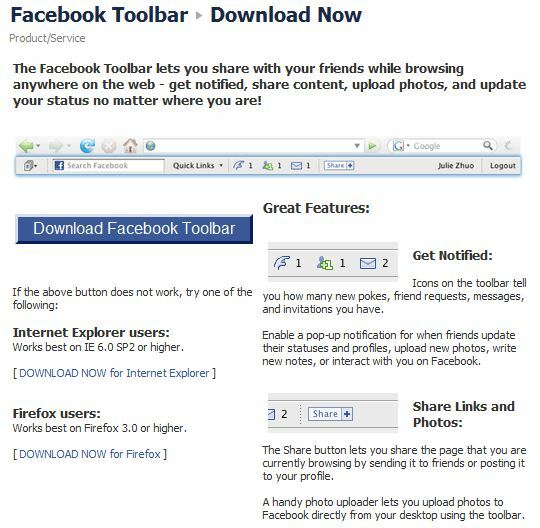 You can download this resource for Internet Explorer and Firefox here: Facebook Toolbar. The Google Chrome version of the toolbar offers very similar features to the version of the toolbar that is supported by the other browsers and is verified by Facebook. In a similar fashion, it alerts you at the top of your browser whenever a friend likes or comments on one of your posts or something else notification-wise occurs throughout your network. You can download this tool here: Facebook Toolbar for Chrome. 2. Connecting Bing + Facebook: Microsoft’s search engine Bing and Facebook have a long running partnership that is continually evolving and consistently threatening Google’s standing in the industry. Recently, Bing and Facebook have unveiled the roll-out of Facebook Likes across Bing’s search results. Once you connect your Facebook with Bing here, you can start receiving insights within your search results into websites, movies, restaurants, celebrities, music and other things on the web that your friends already Like on Facebook. People often make decisions based upon the recommendation of their friends and family, and so it makes sense to duplicate this same decision making process across search engines and Facebook. Connect your Facebook to Bing and see what your friends are currently liking. Get Involved: Whether that’s helping Facebook translate the website into different languages or telling your personal stories about how you use Facebook. Site Governance: This section covers everything from ways to share feedback to Facebook’s governing principles and guidelines. Developers: The resource section for developers features links to a variety of tools and forums available to users developing social applications within the network. Behind The Scenes: Looking to follow the bloggers and engineers at Facebook? This subsection leads you to their blogs as well as the career page for Facebook. Need Help: Can’t claim your Facebook Place or upload a photo to your wall? All these day-to-day issues can be dealt with in the help section by posting in user monitored forums or looking through Facebook FAQs. Advertisers: If you’re interested in running Facebook ads or sponsored stories throughout the network, be sure to refer to this section for updates about the process and how to successfully run a promotion using their ad products. Build A Presence: The most important subsection for marketers is this section dedicated to building a successful branded Facebook Page. This last section will take you to a more comprehensive page dedicated to the ins and outs of a Facebook Page, like Facebook Page best practices and examples of other brands’ successes with using Pages. 4. The Open Graph Protocol: This new resource could get an entire blog post written about it because it’s so helpful and cutting edge in terms of marketing on Facebook; however, here’s a quick summary of how this page can help you get started with the Open Graph. The Open Graph allows websites to customize the data Facebook pulls from their web pages to share within their social network. By adding specific meta tags to their webpages, the webmaster can choose how people view the content they share from their website on Facebook. For instance: A company focused around movies, like IMDb, can add code to their website that alters the Like button they install on their various pages. Once a user Likes a particular movie on IMDb’s site, the information shared on Facebook is customized by the meta code previously installed. The Like will now not just post the content on a user’s wall that is Liked, but it will add the movie to the user’s favorite movies under their info tab and gurantee an image of the movie is shared along with the title, director or any other information you specifiy in the meta tag. This is just one example of the many things the Open Graph can do to help customize what your brand shares on Facebook. Visit the Open Graph Protocol developers page for further insights on the feature. 5. Buddy Media’s Guide to Facebook EdgeRank: Facebook EdgeRank is the algorithm that helps determine what content shows up in a particular user’s Facebook News Feed. The exact formula for what content gets shown is a closely guarded secret, much like the algorithm Google uses to rank websites within the search engine. Buddy Media is a firm that offers a variety of Facebook services and as a result, develops many whitepapers and studies about the Facebook Platform. Download the guide to Facebook’s EdgeRank and start to understand how to get your posts to the top of your fans’ News Feeds over other content.